Director of the Center of Educational Testing and Evaluation of Ho Chi Minh City Vietnam National University (VNU-HCM), Dr. Nguyen Quoc Chinh said that the Vietnam National University in Ho Chi Minh City with three member schools including the Natural Science University, the Ho Chi Minh City University of Technology (HCMUT) and the University of Information Technology have had online learning programs and blended courses which have classical form of learning and online learning. In the school’s regulation, an online course will have the maximum of 20 percent of credits. Likewise, Dr. Nguyen Trung Nhan, head of the Training Department of the Industrial University in HCMC, said that the school has adopted international high-quality blended courses for years. After piloting years, blended courses have proved its effectiveness; accordingly, the school has encouraged all faculties to apply them. The school has spent some billion dong to pilot the blended courses. Valuation of online course learners is easier than before. 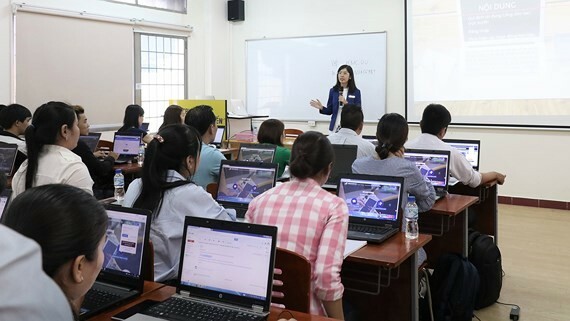 Principal of the HCMC University of Technology and Education Associate Professor Do Van Dung said after five-year pilot program, the number of online courses jumped from 17 to 45,000 with 5 million viewers a semester. Simultaneously, valuation of students also increased from twice to seven times a semester. Classical form of learning will put great pressure on lecturers in valuating students’ progress. For instance, with a 100-student class, a lecturer must write score on 700 homeworks, projects, thesis while a lecturer can valuate learners in online courses. Nguyen Tat Thanh University expanded also blended courses to all faculties in 2017. Till now, 70 percent of subjects in the school are delivered online to learners who both work and study. More and more students take online courses. Truong Tien Tung from the Hanoi Open University said that the online network not only keeps data and helps search for information but also helps lecturers and learners during their study process. When lecturers login procedure, they can value whether learners work hard by counting the number leaners’ login into the system, their participation in the lass and frequencies of taking part in learning forum. Subsequently, teachers can warn lazy students of timetables and participation in the class. Notwithstanding, Dr. Nguyen Quoc Chinh said that online learning has developed drastically in the world and learners are certificated whereas Vietnam does not appreciate online learning and its qualification. Only those who are really thirst for learning register to pursue online learning. Moreover, former Head of the Education Department Dr. Hoang Ngoc Vinh said that concerns over the e-learning quality is correct because of ambiguous recruitment in some localities. In addition to high quality online courses, learners’ need is the key factor in improving the e-learning, he added. Furthermore, the Ministry of Education and Training must set up an inspection group to check the quality of online courses. Qualification is just the first condition that employees must have; recruiters must assess employees’ working ability. Additionally, schools applying online courses must invest in IT infrastructure and training lecturers.